Call 0116 2799083 for Instant Quote! Trade or end users, no minimum order! ...part of a larger order requiring LED tape? 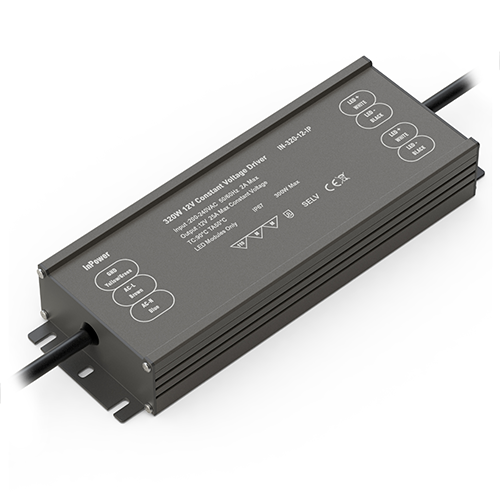 An IP67-rated 320-watt LED driver, this power supply is fully sealed for use in LED projects that require water-resistance. The transformer is available in a choice of 12-volt or 24-volt versions, each able to power up to 320W of corresponding voltage LED lighting. The moisture-proof power supply is suitable for all InStyle LED striplighting products (that includes white LEDs, single-colour LEDs, dual-white CCT LEDs and colour-changing RGB/RGBW LEDs). Because the unit is fully sealed with hardwired connections, it is safe to touch. There is no minimum-load requirement. InStyle LED uses DPD as our delivery courier. Orders are usually delivered between 8am and 4pm. When placing your order, you can upgrade to a pre-10.30am delivery if you wish. We can also arrange a Saturday delivery or send your goods directly to site – please just ask! You can track your delivery via DPD's online tracking page. InStyle products are supplied with a 2-year ‘back to manufacturer’ warranty. You can find more details on our warranty support page. For more information, prices or to order please call 0116 2799 083 or email sales@instyleled.co.uk. Ask your sales advisor for an expected delivery date when placing your order. InPower’s IP67-rated 35-watt LED power supply is ideal for lighting installations that are prone to moisture. Available in a choice of 12-volt or 24-volt versions, with no minimum load. This InPower-branded 35-watt LED power supply is fully sealed for water resistance (rated IP67). We offer two product versions (12-volt or 24-volt), both with no minimum-load requirement. Tried and tested for long life and reliability, this 150-watt IP67 (water-resistant) Mean Well LED transformer is ideal for use with any of our LED tape range. It’s available in both 12V and 24V version, and has no minimum load. All Mean Well power-supply units are tested for long life and reliability, and are ideal for use with InStyle’s LED tapes. This 240-watt IP65 LED transformer (available in both 12V and 24V versions) is IP65-rated and has no minimum load requirement.